Rinnai is introducing yet another product innovation in its continuous drive for the highest possible efficiencies and control over hot water provision in all commercial sites. This pioneering product allows end-users to exercise ultimate control and maximise energy efficiencies in all sizes and types of buildings, even in multi-tenanted sites. Utilising the BACnet and modbus compatible protocol, Rinnai has introduced a gateway that allows a seamless integration of its continuous flow hot water heating products and systems into Building Management Systems (BMS). The Rinnai Gateway enables access to its advanced product functionality including temperature control, fault diagnostics and communication, energy monitoring, trend logging and on/off status. “We have recognised the growing market demand for a reliable and efficient supply of hot water. The Rinnai gateway will provide end-users and FM managers alike with the facility to manage and maintain their hot water supply more efficiently than ever before” says Managing Director Tony Gittings. The Rinnai smart controller offers on/off status as well as fault codes to facilitate first hit repair. For example, the BMS can communicate a precise error code to the central system meaning that in the event of a breakdown the user can communicate the correct parts and information to the engineer for a first time fix, limiting down time and improving Rinnai service response. The controller allows the end user to remotely monitor and change system temperatures and also to monitor and adjust burners for maximum efficiencies. In effect, the controls monitor gas usage to dictate business periods and energy savings. Rinnai units modulate the gas supply in relation to the amount of heat input required to optimise gas usage meaning high energy efficiency is delivered at all times. This is monitored and visualised by the controls. 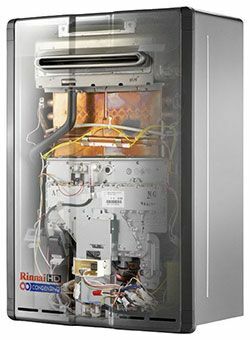 The Rinnai smart controller controls also monitor running hours and service requirements. As Rinnai units are on-demand, operating only when a tap is turned on, suggested service periods can be ascertained from running hours, as well as early warning of scale build up. Rinnai HDC units now contain smart lime scale notification systems to maintain system integrity and prevent in-efficiencies from scale accumulation.